Concrete Cylinder Garden Planters & Pots | Big Sizes | 15 Colors | American Made | Ships across the US. This planter is the workhorse of our concrete line. Its cylinder shape lends itself to dropping a nursery pot into the planter and not having to plant indirectly. With it's large rolled rim rings around the top and its simple cylindrical shape it is perfect for all landscape projects. And, if you need big then look no further. From small to extra large this pot is manufactured in all generous sizes. 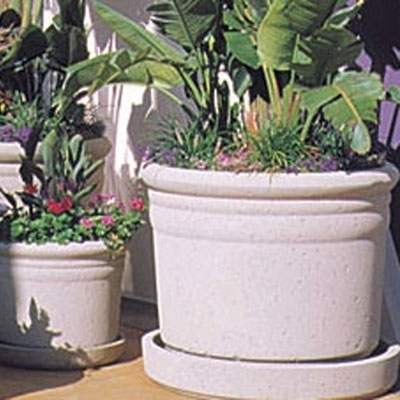 Our concrete garden pottery is manufactured in Arizona using the high-quality concrete mix and molding process. This secret concrete mix includes a volcanic rock harvested in Sedona, Arizona. Compact, durable and available in 15 color choices make these planters the perfect containers for any Home & Garden project. Each mix is colored prior to pouring so any future chips will be hardly noticeable. Choose your color, your finish & your drain hole preference and we will have your planters manufactured just for you!